Brazil and PSG forward Neymar scores four goals in an 8-0 rout of Dijon in the French league but leaves the field disappointed after he is jeered by his own fans. 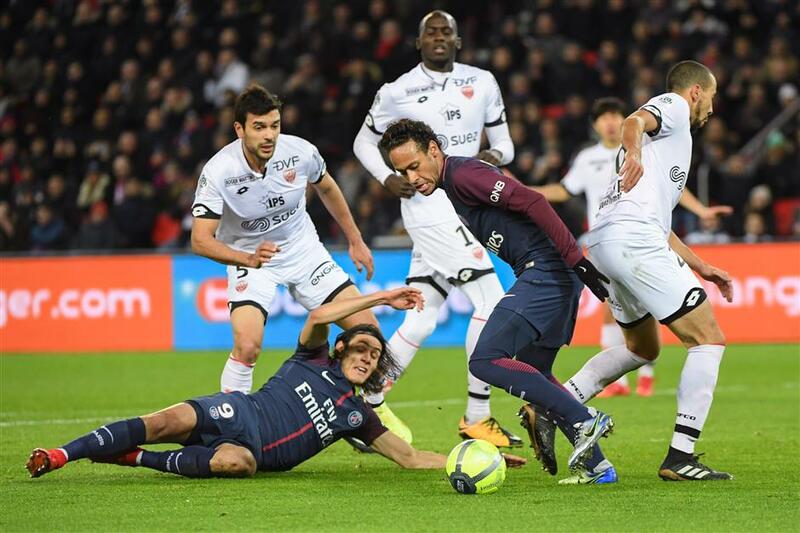 Paris Saint-Germain forward Neymar (center) dribbles past teammate Edinson Cavani (down) and the Dijon defence during their French L1 match on Wednesday in Paris. Man of the Match Neymar scored 4 goals in PSG's 8-0 win. Neymar scored four goals and set up two in a dazzling performance as Paris Saint-Germain beat Dijon 8-0 on Wednesday, yet the Brazil star left the field bitterly shaking his head in disappointment. It was the perfect moment to show generosity but, perhaps because the pair had previously clashed over a penalty, Neymar was having none of it. Instead, with some fans chanting “Cavani, Cavani,” he jealously guarded the ball as Cavani gingerly approached, and then totally blanked him. Coolly, he sent goalkeeper Baptiste Reynet the wrong way. The incident in September, amusingly known as Penalty-gate, saw Cavani refusing to let Neymar take a penalty and then missing. It still seems to linger. At the end, Neymar took the match ball from the referee — players can keep it after a hat-trick — but looked downcast as he trudged off the field at Parc des Princes. After shaking his head, he even palmed off his Man of the Match award to a PSG staff member as he walked hurriedly back to the dressing room, not stopping for waiting television reporters. Cavani moved level with Zlatan Ibrahimovic as the club’s leading scorer with 156 goals in 226 games, since joining from Napoli in the summer of 2013 for a then-club record of 64 million euros (US$76 million). By comparison, Ibrahimovic scored his in 180 games. He left after the 2015-16 season, after which Cavani came into his own, having often been pushed out wide right to accommodate the Swedish star.